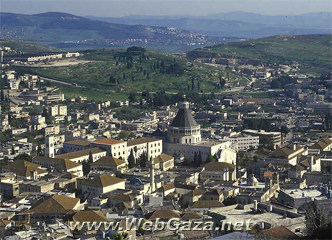 Nazareth (An-Naasira) - Where is Nazareth City Located? Last weekend, Catholics in Nazareth and around the world celebrated the most holy and significant events to Christianity, Good Friday and Easter Sunday, marking the death and resurrection of Jesus Christ, a man in Biblical times known simply as "Jesus of Nazareth." However, today Nazareth faces a slow and painful death in the face of land theft and colonization. In 1948, during what Palestinians call the Nakba, over 750,000 Palestinians were forcibly expelled from their homes and country through direct physical expulsion, ethnic cleansing or psychological warfare, leaving only one third of the original inhabitants in historic Palestine. Even the indigenous Palestinians who remained during the period of 1947-49 became internally displaced refugees in the newly created state of Israel, due to laws passed by the Israeli government that transferred land to the state by declaring it a military zone and did not allow for Palestinians to return to their original homes. Until today, these internally displaced refugees have no right to return to their original land, towns or villages and presently account for more than 355,000 refugees inside Israel. Before 1948, Nazareth was an all-Arab town of some 15,000 inhabitants, over 60 percent of whom were Christian and the rest Muslims. As such, this town fell in the proposed borders of the Arab state of UN Partition Plan 181. Nonetheless, on 16 July 1948 Nazareth fell to Zionist forces. In addition, while ethnic cleansing was central to the Zionist colonial project in Palestine, the Zionist forces were aware before the creation of Israel how Nazareth and other Christian holy cities in Palestine were symbolized and romanticized in the popular imagination of western Christians. Yosef Weitz, who was director of the Jewish National Fund's Land Department and a key figure in planning land settlements before and after the creation of the state, stated that "there is no way but to transfer the [Palestinian] Arabs from here to the neighboring countries, to transfer all of them, save perhaps for [the Palestinian Arabs of] Bethlehem, Nazareth, and the old Jerusalem." In view of this reality, there were direct orders to "spare" Nazareth the expulsion, looting, desecration and destruction that plagued other places in Palestine, and most importantly to protect the Christian religious institutions in fear that this would create outcry from Western nations. Indeed, Nazareth was spared the ethnic cleansing of the Arab population that occurred in different Muslim, Christian and mixed Jewish and Arab towns and villages. Because of the status this town had internationally, it was also used as a place of refuge for over 20,000 Arabs that were expelled from the surrounding villages. Control of land was as central to the Zionist colonial project as it is today, since it allows the colonial power, now the state of Israel, to maintain its hegemony and control over the indigenous population. Therefore, even though Nazareth was spared from the destruction and ethnic cleansing of 1948, the Zionist forces and later the Israeli state had different plans for the holy town of Nazareth. Haim Laskov, who was the Zionist commander at that time, stated that "we had specific instructions not to harm anything, which meant that we had to take Nazareth by stratagem," which is exactly what happened and is continuing to transpire in a slow and vigorous process. The disheartening reality about present-day Nazareth is that it has lost some of its charm and traditions from the past and it is no longer a thriving city, despite that it is the most populous Arab city in the Galilee with 70,000 residents. The chief reason for this is the creation of the Jewish settlement of Nazareth Illit (Upper Nazareth) adjacent to and overlooking the old Arab city of Nazareth. The creation of this settlement has prevented Nazareth's natural growth and expansion, as well as its economic and social development, most particularly in the old souq (market) of Nazareth. Even more, in a government plan to "clean up" the souq in 2000 before the Pope's visit, the Nazareth 2000 project done in coordination with the Nazareth Municipality, the Israeli government and its ministries made plans for the reorganization of Nazareth without considering how this would effect the people. Walking through the souq just a week before Easter, it's not difficult to notice the abundance of abandoned homes and closed shops as well as the struggling owners of the shops that do remain open. Undoubtedly, the condition of the souq is very bad and only getting worse. Ahmed Ali al-Saidi, also known as Abu Ali, is one of the older shop owners and has witnessed the souq disintegrate before his eyes. Originally from the village of Saffouriya and having owned 70 dunams of land in the village, he remains an internally displaced refugee living in the old souq of Nazareth. He explained that previously, at this time during Easter there would hardly be room to walk in the souq. 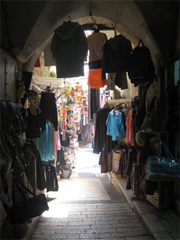 Nazareth's souq was the city center and people from surrounding villages would come to buy clothes and other gifts before Easter. Abu Ali spoke of a friend of his that had eight stores in the souq, of which all are now closed. 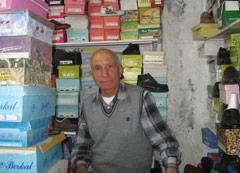 Abu Ali in his shoe store in the souq. According to Abu Ali, "the town of Nazareth was divided and planned on paper following the establishment of the Israeli state, but this plan would take place in a slow process until its end goal was eventually realized." Having worked in construction before moving and opening his shop in the souq, Abu Ali was unaware that the building he was working on would house the municipality of Nazareth Illit 25 years later. Two years after Nazareth Illit was founded in 1954, the first settlers arrived in line with the government plan of "Judaizing the Galilee" to safeguard the "Jewish character" of the Israeli state. In 1954, despite protests from Palestinians, the first 1,200 dunams of land were expropriated from Palestinians, supported by laws that permitted the government to declare land a military zone and seize control of it for "security reasons." In 1957 Nazareth Illit was built as a development town, officially being established in 1962 and continuing to grow and attract Jewish immigrants and large industries. At the moment, Nazareth Illit is continues to achieve what it originally set out to do: halt the development of Arab Nazareth by overpowering and strangling it economically, politically and socially. As Abu Ali sorrowfully exclaimed, "it is Nazareth Illit that all along was planned to be the thriving city, not the original Nazareth where the majority of Arabs live." He added, "I have been in the souq for 30 years and don't know where I will go from here; there is nothing I alone can do." In the last 10 to 15 years, the major businesses and hotels have moved up to Nazareth Illit, now home to 40,000 Jewish settlers and a few wealthy Arabs, essentially killing the once prosperous businesses in the old souq. Abu Amer, who owns a bakery in the souq, passionately explained that "the simple people are abused by all, by the government and the rich man, and nobody cares about our situation. It is all about self-interest and profits. For us in the souq, the human being and the collective is the highest capital, but for the rich people, money is their sacrosanct capital and end goal." One of the residents in the souq who moved there to protect its unique character and history, Firas Helou, maintains that "for the government, big businesses and the municipality that all work hand in hand, preserving and protecting the souq is viewed not from a social and historical perspective, but strictly economical, and for them investing in the souq is not economically beneficial." The fact that conditions are so awful in the souq means that for the poor families living there, most do not have money to support the remaining shop owners. Mundar Abdo, for example, opened the first art gallery in the souq and designed everything himself, but his shop stays closed the majority of the time. Because tourism is also controlled by the state, residents complain, many tour guides often give tourists a wrong impression of the souq, telling them to watch their purses and wallets and not purchase from Arabs. Abdo stated, "last week I had a group of 100 tourists come to the gallery and maybe two or three of them bought something small from me because I am an Arab and they are usually brought to the souq last when they have already completed most of their shopping." Moreover, tourists are taken directly to Israeli jewelry factories in the tour buses, making small jewelry store owners in the souq such as Rami Farah exclaim that "tourism actually ruined the souq; it was better before." He added, "look, this week is Easter and Mother's Day and there is not one customer here to buy jewelry." The final economic and social blow that hit the souq was the so-called master plan to give old Nazareth a "new look" for the anticipated flow of Christian pilgrims during the Pope's visit in March 2000. The Israeli government, in cooperation with Nazareth Municipality, the tourism ministry, the state-run Tourist Corporation, and other ministries planned the Nazareth 2000 project. The streets of the old city were turned into promenades and Paul VI Street, which is the main street in Nazareth, was permitted only for tour buses as other traffic was diverted to al-Salam street. The Israeli government claimed that this new traffic system was meant to ease the movement of and facilitate parking for tour buses, not showing any concern for the population of Nazareth. The two main squares in the city, Mary's Well Square and City Center Square also provided tour buses with parking, allowing tourists to visit the holy sites and souq and return to their buses afterwards. While Nazareth 2000 was meant to promote the souq, shop owners experienced the opposite effect. Maher Ayad, who owns a bridal and dress shop, explained that "following the changes done in the souq in 2000, people began abandoning the souq." During the reconstruction of the souq, many stores were closed and it took a long time to repair and people stopped coming. When the souq was finally reopened, it did not benefit shop owners and did not allow them to put out their merchandise in open places. Furthermore, according to Ayad, by closing the streets and making them into promenades, "after Nazareth 2000, people had no place to leave their cars. If someone parks their car on the street, they will get a ticket or it will be towed. Also, people these days don't want to inconvenience themselves by walking and want things easier all in the name of 'progress,' which is making our conditions here worse." The constant neglect of the souq has also given it a bad reputation that it is dangerous at night. Tourists are warned to watch their bags, purses and wallets and as such, walking through the souq at night, one feels they are in a dead city. Firas Helou explains that "the souq today is actually safer, more personal and secure than before." He also added that "the municipality gives no encouragement for people to move back to the souq nor invest in it, and basic services such as electricity, water and the sewage remain [in an] awful state." To make matters worse, the Israeli Antiquities Law defines antiquities as objects that were made by humans before 1700. Antiques found after 1700 are left up to the discretion of the Ministry of Education to recognize them as such. The effect is the willlful neglect Palestinian history. Until today no Palestinian structure has been given historical value by the ministry as opposed to structures that would support the Zionist narrative in the land. Such a law has kept the majority of the homes in the souq in poor condition, while the majority of poor families that remain do not have the financial means to fix the old structures themselves. Abu Ali, speaking in the name of all shop owners in the souq, said what he wants from the Nazareth Municipality, which according to him is more a token than a municipality that works for the interest of the people, is "to offer parking for cars that will make it easier to enter the souq, and promote and advertise Arab products in the souq because without this, the situation will only get worse." The conditions of the Nazareth souq reflects the condition of Nazareth as a whole, substantiating that it is a myth that the majority of Palestinian Arabs living under the Israeli state are comfortable and content with their current circumstances. Unfortunately for the people and city of Nazareth today, that is all Nazareth remains, an idea in the past, a fantasy in the Christian mind and a destination for Christian pilgrims who remain unaware of this historical city's present situation and its continued slow and painful death. In the words of Abu Ali, "this city [Nazareth] must shine again because this is the city of Jesus Christ, a holy city, and should be opened to all tourists, not closed." Tow Images by Christine Bro. Christine Bro is a recent graduate of McGill University.